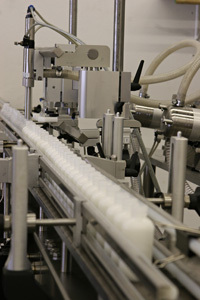 RainShadow Labs offers full service in-house filling, labeling, and packaging capabilities. We fill most bottles, jars, tottles, candle jars, votives, and tubes. We can provide complete finished product packaging and filling, including unit cartons; lot stamping for labels; lot stamping for boxes; pre-tied ribbons; stickers; bagging finished product; case packaging; wrapping in tissue paper; wrapping in bubble wrap; and any other fine detail for your package. Rainshadow Labs is unable to fill product that has not been manufactured here at our facility. We are also unable to fill aluminum tubes or lip balm tubes. Minimum run requirements are 25 gallons for wet products or 200 lbs for dry products.